As a peering administrator, you are responsible for selecting the best peering strategy for your company. In order to determine what’s best for your organization, you need to identify your peering goals. Very frequently, these goals might be at odds. Let’s start with reviewing possible peering objectives and then continue with a discussion on why it is difficult to satisfy all of these requirements at the same time. By going through the objectives list, it is clear that the low-cost goal is at odds with other stated objectives. To achieve the best connectivity and high availability, you’d need to peer with as many companies as possible, but peering costs money. At the same time, improved peering might lead to increased revenue, as your network will attract more traffic. The reality of the situation is that you will need to find a compromise by determining the number and types of peering that is right for your company. 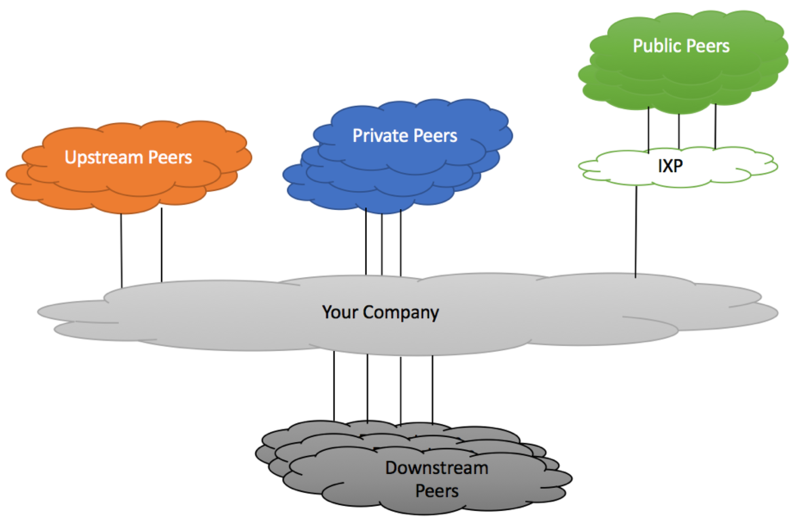 Figure below shows an ISP (labeled as “Your Company”) connected to different types of peering partners. Unless you work for the elite group of Tier 1 providers (https://en.wikipedia.org/wiki/Tier_1_network) you will always need to buy Internet Transit Service from one or more service providers. This Transit Connectivity is sold by Upstream providers, who will feed you the full Internet BGP view table and, at least in theory, will deliver your packets to any device on the Internet either over their own network, or via their partners and clients. Selecting the right upstream provider or group of upstream providers is one the most important decisions you’ll need to make while building your network. Reliability, Connectivity types, cost per Mb are just some of the factors that will influence this decision. We’ll talk about selecting the right Upstream later in this article. By accepting the full BGP table from Transit provider, your routers’ routing tables will get populated with the information about each and every IPv4 (and possibly IPv6) prefix currently present on the Internet. In return, you will advertise your locally-originated routes, as well as routes received from your BGP customers. Most organizations will employ direct transport links with their Transit providers, although it is possible (but typically not cost-effective) to leverage physical transport provided by an Internet Exchange Point (IXP) for upstream connectivity. 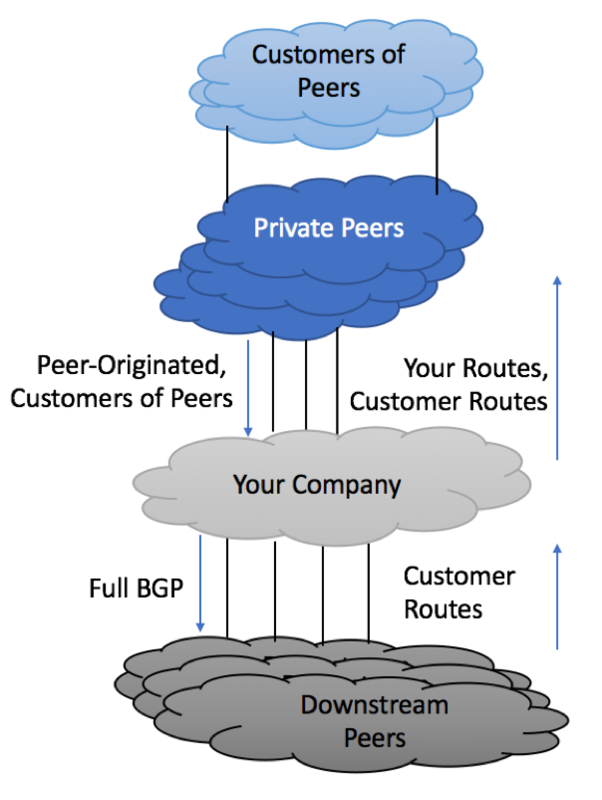 Private peering is the type of peering where two parties establish BGP connectivity over direct transport link and exchange information about routes originated in their own and their customers’ networks. While most of private peering arrangements are settlement-free, meaning that companies do not pay each over to exchange traffic over private links, there are also cases where an ISP might refuse to establish settlement-free relationships with your company, but is willing to sell access to their customer base at a discount, as compared to buying full transit connectivity from that provider. It is also important to remember that while the traffic exchange might be free, there will be a cost associated with the physical transport (e.g. 10GE link over DWDM), as well as the cost of a port on your router where this link will be terminated. In some cases, it might be difficult to predict how much traffic you will exchange with specific peer before establishing direct peering relationships. Although various traffic analysis tools such as Arbor SP might provide you with an estimate, we find that these predictions are not always reliable. When possible, you should start with establishing Public peering relationships with a prospective peer and, assuming the amount of traffic justifies this, later convert to the Private peering relationships. Figure below depicts private peering relationships with “Your Company”. Depending on the size of the peer, you might receive from them anywhere from a few routes to tens of thousands of routes. Large number of routes does not necessary mean high volume of traffic. Big CDN provider with just a few prefixes can deliver much more traffic to your network, than an ISP with thousands of prefixes in some remote geography. Public peering is a type of relationship where two companies exchange IP traffic via one of public Internet Exchange Peering Points (IXP). The main advantage of peering at IXP is the ability to establish sessions with a large number (often hundreds) of partners, without the need to build individual transport links with all these peers. While most of peering relationships at IXP’s are settlement-free, there is often an initial connectivity cost, as well as a monthly recurring cost charged for IXP connectivity. In addition to that, there is a cost associated with a transport link between your peering router and IXP port. In fact, IXP charge and the transport cost when added together, might exceed the cost of buying IP transport from one of the Transit Providers. With this being said, it is always good to be aware of the peering options in your geography, as not being connected to large IXPs might put you at a competitive disadvantage. It is also important to note, that presence at an IXP does not automatically mean that you will be able to peer with all Exchange members. While some IXP participants have open peering policy, meaning they will exchange traffic with any other IXP member, other organizations are more restrictive and you will need to negotiate peering relationships with them on a case-by-case basis. 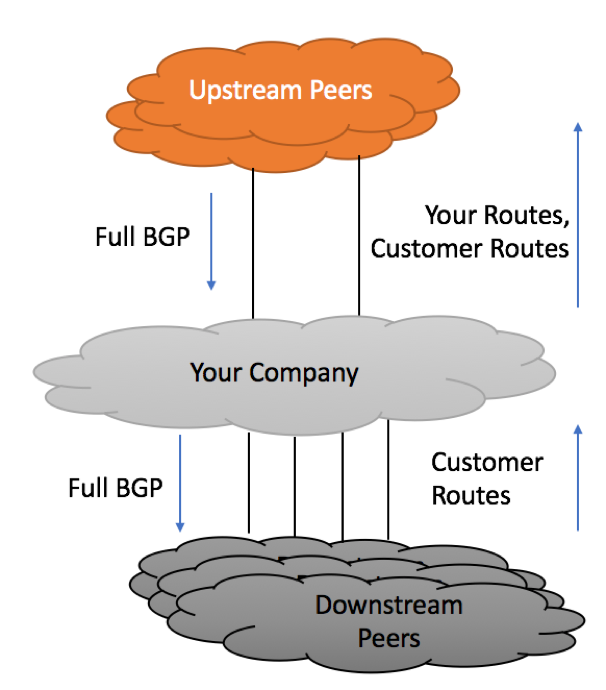 BGP peering with your customers, also known as Downstream peering, is the type of a relationship where your company performs the function of a Transit Provider. IP Prefixes received from downstream peers should be re-advertised to all your peers, including Public, Private, Transit, as well as your other BGP-speaking customers. Now that you’ve been introduced to various types of peering, let us review a few use cases. You were asked to recommend a peering and transit policy for a small regional Internet provider called “ISP Startup.” This company operates in the country where two large incumbent providers control nearly 80% of the country’s user base. These incumbents buy transit connectivity from various Tier 1 ISPs. Incumbents peer with each other, but will not join settlement-free peering relationships with small local ISPs. There is an Internet Exchange point in the country. Some Global Content Delivery Networks (CDN), small local ISPs and Enterprises are connected to this IXP. At the moment, “ISP Startup” does not have any BGP clients, but plans to acquire them in the future. The current goal is to minimize the Internet transit cost, while providing the best possible service to end users. Figure below depicts connectivity alternatives for the new ISP. This use case will not be complete without some assumptions about transit costs. IXP is the cheapest option by far, but it is not a substitute for Transit Internet connectivity. It might be relatively inexpensive to connect to an IXP, but our “ISP Startup” may be disappointed by the amount of traffic exchanged over IXP links. While there are many contributing factors (a type of ISP’s own customer base, number and type of IXP participants), you should not expect to offload more than 30% of your traffic to IXP. In fact, this number might be significantly lower than that. Your next decision is to select one or more upstream providers. If you base your decision on cost, “Tier 2 – A” ISP is the winner. You would establish at least two redundant links to “Tier 2 – A”, and might build a non-redundant link to the IXP as shown below. There is no upstream redundancy – failure of “Tier 2 – A” ISP would take your company off the air. If your ISP Startup grows and you acquire BGP customers of your own, it will be difficult to attract transit traffic, as your network will be a few AS hops from the majority of Internet destinations. 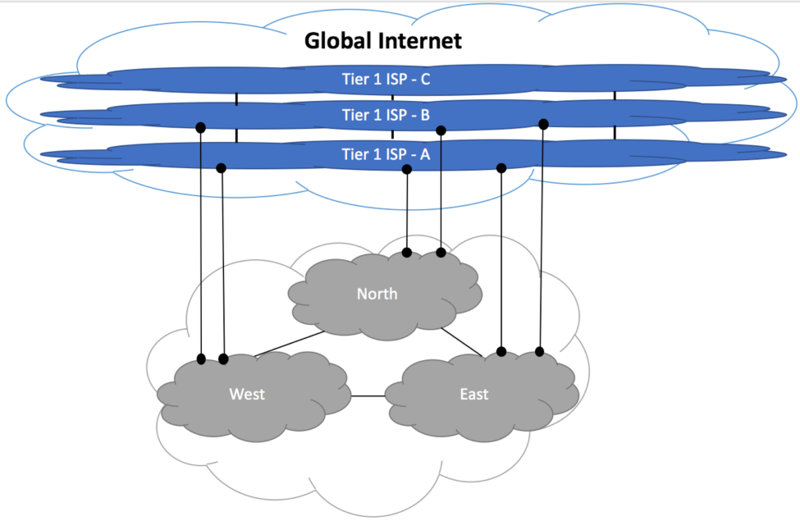 Let’s look into an alternative where ISP Startup connects to “Incumbent A”, “Tier 1 – A” and IXP. Link to “Incumbent A” will provide you with direct access to “Incumbent A’s” customer base, as well as with a short path to “Incumbent B’s” clients. IXP connection will help you to reach the remaining local ISPs and provide access to CDN networks. Direct “Tier 1” connection will give you access to the rest of the Internet. If Tier 1 link were to fail, you would reroute your traffic to the Internet via Incumbent A. 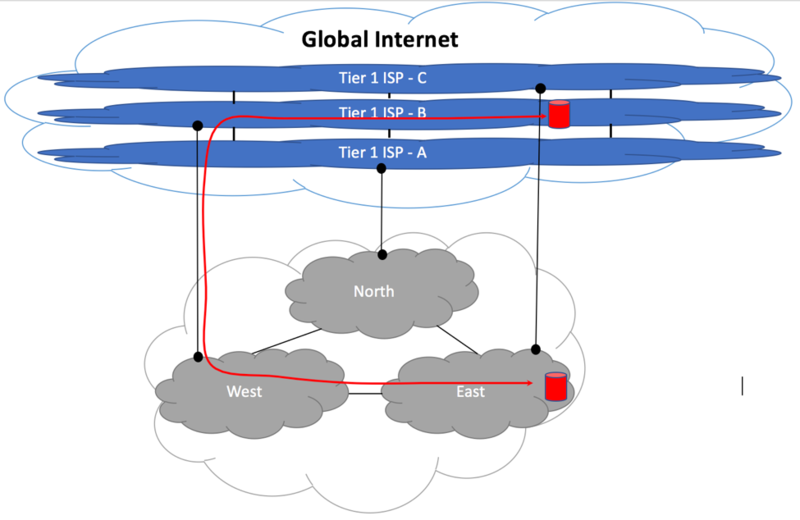 If links to “Incumbent A” or IXP were to fail, you would reroute via “Tier 1” ISP. In addition to that, it will be much easier to attract transit internet traffic to your AS, if you peer directly with one of the global Tier 1 providers. Let us compare monthly costs, based on the assumption that your network needs 100Gb pipe, of which 10% can be offloaded to IXP, 20% is destined to Incumbent providers and the rest needs to go to the Internet. As you can see, Option B is ~30% more expensive. You will need to decide, if increased redundancy and improved latency warrants this premium. In this case study, we will analyze the scenario of an ISP operating in 3 different geographical regions using one common AS Number. We’ll call these regions West – North – East, although in the real life they can represent three cities, countries or even continents. Similar to the previous example, this Medium-Size ISP needs to decide on the best connectivity options, while delivering exceptional service to its customers at the lowest possible price points. Let’s review Transit, Public and Private peering options. Because of the size of the company and its desire to attract BGP clients, our ISP is inclined to buy transit from Tier 1 ISPs only. It believes that sometime in the future it will be in the position to negotiate settlement-free peering with Global Tier 2 providers, making it not feasible to buy transit from one of them today. When it comes to choosing an ISP, the first possible approach is to select three different transit ISPs, one per region. The clear advantage of this approach is the resiliency of Global Internet connectivity. If one, or even two links to Tier 1 ISPs were to fail, traffic could always be rerouted via the remaining connections. It is also believed, that direct connectivity to multiple Tier 1 ISPs would help you to attract Internet traffic from your own BGP clients, making your company more profitable. You might not be able to negotiate an attractive per Mb transit rate, as your per-Tier 1 ISP traffic commitment in each of the regions will be relatively low. Sub-optimal routing and possible high latency that you are likely to experience. Let’s explain technical reasons to why this might happen. While this type of traffic flow might be acceptable, if your North / West / East regions are just a few miles away, it may pose a problem if there is a significant distance between them. Due to the speed of light limitations, distance always translates into packet latency. You can try to manipulate your BGP advertisements towards upstream providers, setting AS-Prepend or sending BGP communities in the attempt to prevent this sub-optimal traffic flow from happening, but you are unlikely to find an acceptable remedy for this scenario. BGP protocol likes shortest AS Paths and ISPs prefer to send traffic to their directly connected clients instead of passing through a third party. Instead of connecting to three different Service Providers across three geographical regions, you might be better off by picking just two transit providers, but connecting to both of these providers in all three geographies. Under normal conditions, you’d see the optimal traffic flow between the Global Internet and any of your regions. If one of the links were to fail, traffic to that ISP would reroute via two remaining links. This will increase end-to-end latency for some destinations, but this tradeoff should be acceptable. 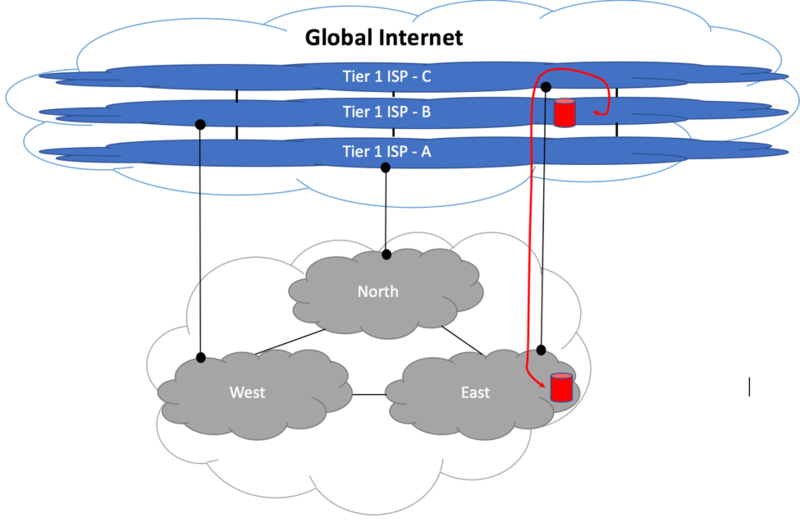 As described in the “Pubic Peering” section of this paper, IXP locations are great places to establish direct connectivity to a large number of ISPs, Enterprises and CDN providers. As such, it is encouraged to be present at the public exchange points within ISP’s operating geography, and if cost permits, outside of operational boundaries. For example, service provider operating in Portugal, Spain and France should consider connecting to the largest European Peering points in Germany (DE-CIX), Amsterdam (AMX-IX) and London (LINX). When establishing peering relationships, ISP should consider its own geography as well as peer’s geographical presence. Figure below depicts potential peering scenario, where peering relationships could be established with “Public Peer – A” and “Public Peer – B”. “Public Peer – A” operates in West and North regions, as well as some other geographies, not covered by you. “Public Peer – B” operates in North and East regions, and also some other non-overlapping regions. It should be no brainer to establish peering with “Public Peer – B” via “IXP-North” and “IXP-East”, as you would achieve optimal traffic flow between you two companies. Traffic originated from the West region will leverage IXP-North / IXP-East exchange points. This is acceptable as “Public Peer-B” is not present in the West. Decision to peer with “Public Peer – A” is more difficult. 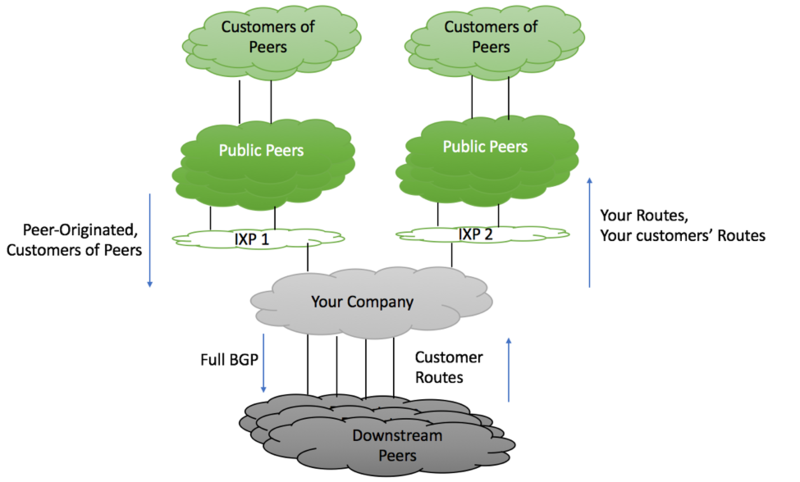 You can only peer at “IXP-West”, as “Public Peer – A” is not present at other exchange points. This will lead to sub-optimal traffic flow between your “North” customers and “Public Peer-A” customers located in the North region. You are almost guaranteed to achieve better performance by sending the North traffic via one of upstream providers. Recommended solution to this problem is to advertise a subset of your routes to “Public Peer – A”. 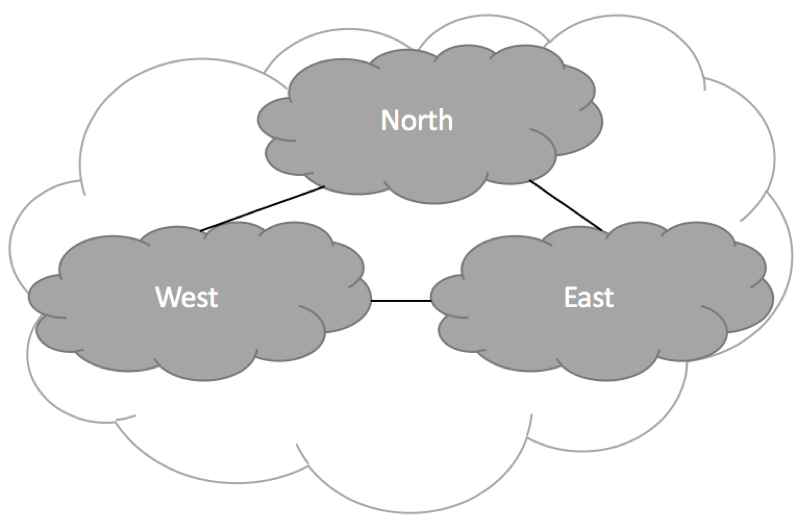 Instead of sending all the routes originated by your company and your BGP downstream customers, only advertise the routes originated in the “West” region. The same should apply to the routes advertised by “Public Peer – A”. Request your partner to limit their advertisement to their Western routes. Use your transit provider to exchange traffic between “Peer-A” Northern region and your North and East areas. Most of the service providers start their peering relationships at IXP and upon achieving certain traffic volume might later switch to a private peering arrangement. By switching to private links and bypassing IXP, they can both improve network availability and decrease traffic cost. Peering recommendations covered in Transit and Public sections of this document are also applicable to private peering arrangements. If companies operate in the same geographical regions, they should establish peering sessions in as many points as possible in order to minimize end-to-end latency. It is not uncommon to see a connectivity scenario, where two companies leverage private connectivity arrangements in some areas, while relying on public peering in other areas. Even after building direct links to a peering partner, you can still maintain BGP sessions at public peering points, diversifying your connectivity. Obviously, you’ll need to manipulate BGP attributes to make sure that private links are preferred over public exchanges. Next diagram depicts such hybrid scenario. Private peering links were established in the East and West regions. In the West region, companies decided to preserve existing public peering relationships to maintain direct connectivity in case of the private link failure. Direct peering in the North was considered unfeasible due to low traffic volume. As such, two companies rely on “IXP-North” for local traffic exchange. Our Medium-size ISP has two 100GE links per region to two transit providers. There are also 10GE links to IXP-West, IXP-North, IXP-West. While peering in these locations, Company XYZ was identified as a candidate for private peering connectivity. Netflow data shows that during peak hours, 300Mb/sec of traffic is being exchanged between the two companies. As a result, it is decided to build direct 1GE links in all three geographic regions. Everything works great until Company XYZ releases a new version of their software, and many customers on the Internet decide to download it at the same time. This causes a major congestion on private 1GE links. If companies were not to switch to the private peering and leveraged 10GE IXP connections instead, they would have easily coped with this sudden traffic increase. 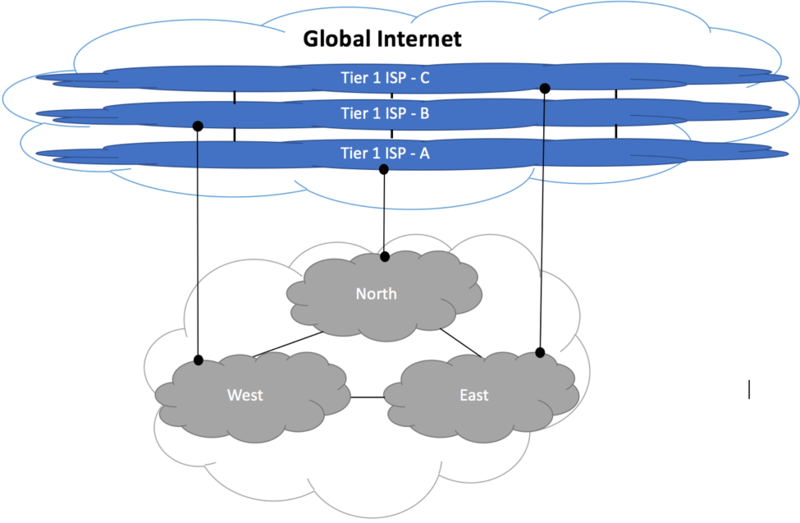 In this article, we will attempt to forecast the size of global internet routing table and analyze the potential impact of aforementioned routing growth on the stability of Internet infrastructure. Global routing infrastructure is comprised of IPv4 and IPv6 routes advertised by BGP-speaking service providers and enterprises. These BGP advertisements are processed by the routers and eventually programmed into special tables called Forwarding Information Table (FIB). There is a limit a number of FIB entries a particular system can support before running out of FIB capacity. The maximum FIB capacity of the platform is determined by such factors as ASIC, amount of memory, software license, etc. Even within a single vendor’s portfolio, the maximum FIB size of available platforms varies dramatically, from a few thousand entries in a low-cost top or rack switch up to millions of entries in an expensive Internet router. It is important to note, that advertised FIB numbers may only be applicable to certain (typically IPv4) routes. Other route types, such as MPLS VPN and IPv6, might require more memory per entry, decreasing the overall FIB capacity. For example, Cisco’s Catalyst 6500 / 7600 with 3BXL supervisor can support 1 Million IPv4 routes, but only 512K IPv6 routes. It is also important to note, that not all vendors will support dynamic allocation of FIB entries between route-types. Instead, FIB might be pre-partitioned to support some arbitrary number of entries of a certain type. Previously mentioned 3BXL supervisor comes preconfigured to support 512K IPv4 + MPLS entries and 256K IPv6 + Multicast entries. It is easy to spot that in Cisco’s SUP720 implementation IPv6 routes take twice as much space as IPv4 entries. 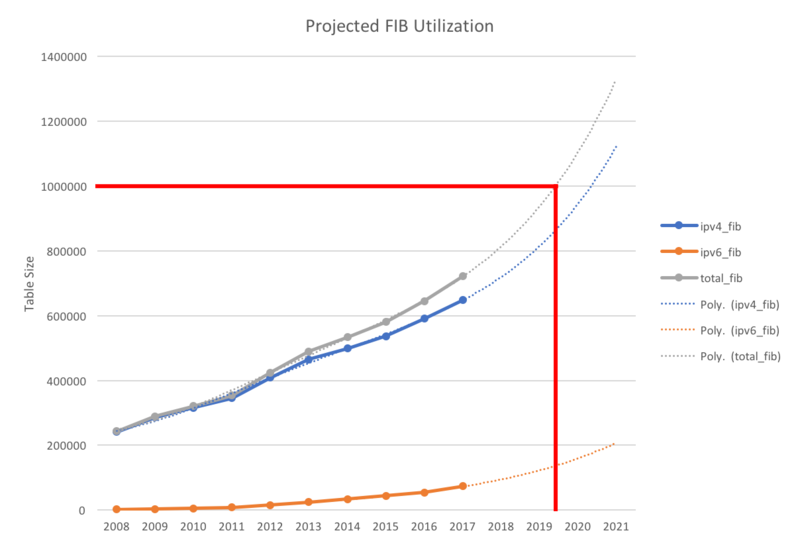 The problem of FIB capacity and growing Internet size is not new. Multiple outages were reported back in 2008 when Internet BGP table size crossed 256K limit and again in 2014 when 512K entries limit was exceeded. Service Providers and BGP-speaking enterprises had to take remedial actions in order to maintain Internet stability. We will discuss these actions later. There are two major forces that drive Internet table size growth – IPv4 space partitioning and new IPv6 advertisements. IPv4 address exhaustion (https://en.wikipedia.org/wiki/IPv4_address_exhaustion) that occurred before 2011 and 2015 did not slow down the speed of IPv4 table growth, instead it accelerated the fragmentation of IPv4 space. 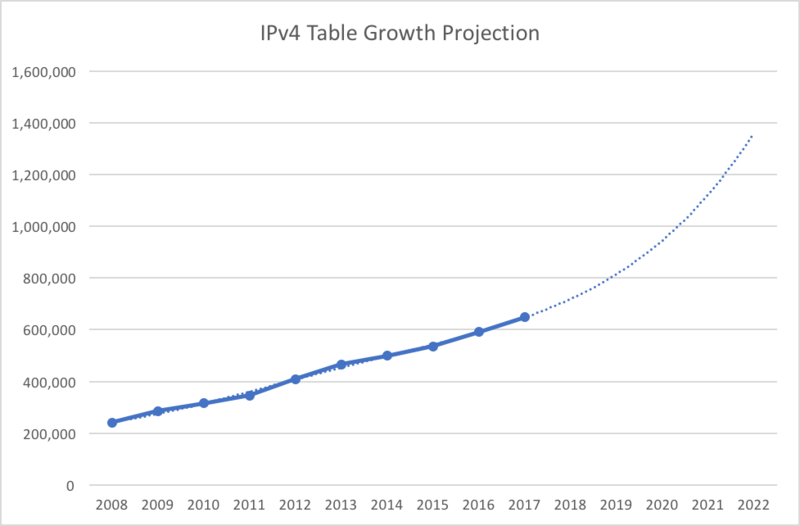 As mentioned previously, IPv4 table size continues its rapid expansion, demonstrating approximately 10% year-over-year growth over the past few years. Our statistical model shows that if this growth continues, global Internet table will surpass 1 Million entries sometime in 2020. As IPv6 gets adopted by Service Providers and Enterprises, IPv6 table size is also expected to continue to raise. The current year-over-year growth is about 30% with no signs of deceleration. 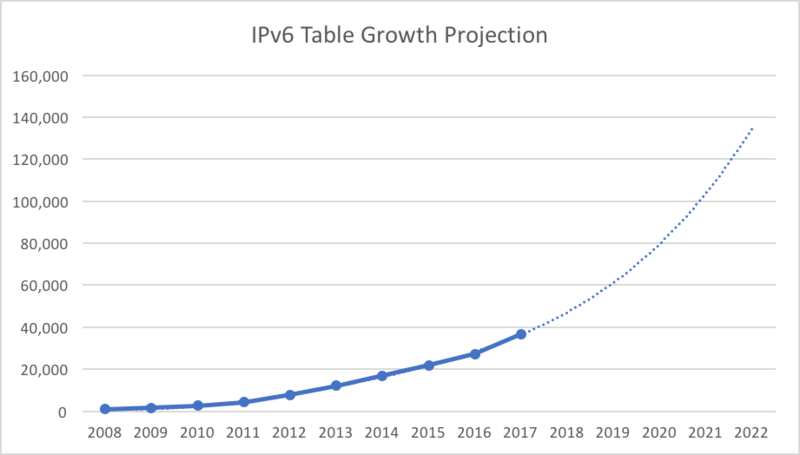 While IPv6 table is not expected to grow to the same size as IPv4 table due to much bigger initial block allocations by the registries, ongoing IPv6 adoption will nonetheless lead to the table size increase. Provide other services that require FIB space, such as Mutlicast, MPLS VPN, L2 VPN, etc. Assuming that the FIB size of your Internet-facing router is limited by 1 Mln entries, you can expect to run into issues sometime in 2019. The actual impact will depend on the platform in use. Some systems might attempt to fall back to RE-based forwarding for the destinations which could not be programmed in hardware. This might lead to high CPU utilization on the entire system and general instability of the router. Other systems will simply drop traffic to such destinations. This scenario can manifest itself by customers unable to reach some sites on the Internet, while accessing other sites. You should monitor system logs and FIB utilization to spot the issue. If upgrade is not viable at the moment, consider inbound route-filtering to decrease the number of routes accepted from your peers. The general consensus is that you can safely drop all IPv4 /25 and longer prefixes while maintaining full reachability of Internet destinations. Internet global routing table continues to grow with no signs of slowing down. The major contributor to this growth is an ongoing IPv4 disaggregation, as well as a proliferation of IPv6 Internet. As a network administrator, you need to be prepared to protect your network from negative consequences of this growth by optimizing your routing policies and upgrading physical infrastructure.